MEMBERS OF THE Dáil’s Public Accounts Committee believe they are being ‘nobbled’ in their attempts to compel former Rehab executives Frank Flannery and Angela Kerins to appear before it. The PAC has been told by the Committee on Procedures and Privileges (CPP) that it needs more information about an application to it to compel Flannery and Kerins to answer questions over controversies surrounding the disability organisation. However some members believe that a letter from the CPP stating this is tantamount to being refused the power of compellability altogether. The committee now intends to seek outside legal advice over its position in relation to compelling Kerins and Flannery who have both refused to appear before PAC to discuss the spending of some €95 million in public money. 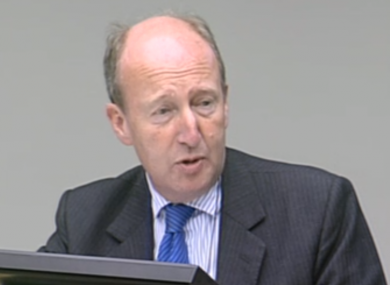 Independent Shane Ross and Sinn Féin Mary’s Lou McDonald both claimed that the CPP’s letter is an attempt to “nobble” the PAC’s investigation of Rehab. “I think there is an attempt to nobble our work,” McDonald said. Earlier the committee heard that following a meeting last night the CPP had written the letter to the PAC asking for more details, including the names of individuals the committee wanted to compel. Committee clerk Ted McEnery said that the application for compellability had originally been “quite general” to “spread the net” over government bodies and publicly-funded organisations. Though the letter is seeking more detail on the application to compel, many committee members have taken it to mean that the PAC’s request is being refused. “I think it’s implied that we won’t be getting compellability,” Fine Gael TD Eoghan Murphy (below) said. Ross went further saying that “what’s intended here is to give us a refusal by any other name”. McDonald said that the committee should furnish the CPP with responses to each of their “challenges” and seek outside legal advice. Chairman John McGuinness said that the committee should seek outside legal advice from a senior counsel to determine what sort of response should be issued to the CPP. Ross also said that the work of the CPP should be open to the public, noting the meetings are in private and he was not allowed to attend the one which took place last night. McGuinness said this would be outside the PAC’s remit. Read: What skills does Rehab want its new CEO to have? Email “PAC's attempts to question Frank Flannery and Angela Kerins 'nobbled' ”. Feedback on “PAC's attempts to question Frank Flannery and Angela Kerins 'nobbled' ”.